Halve the avocados, deseed and dice. Place diced avocado in a large mixing bowl; add the juice of the lime, grated ginger, sesame oil, fish oil and coriander. Season with salt and pepper. Mash until well combined. In a simmering pot of hot water add enough vinegar to be able to taste, swirl spoon in the water to create a vortex, crack both eggs in the middle and cook for approximately 3 minutes. Once cooked, lift out of water and touch the centre to ensure they are done and not too hard. On a griddle pan, toast the sourdough slices. Once toasted, place on serving plate, spoon avocado on top. 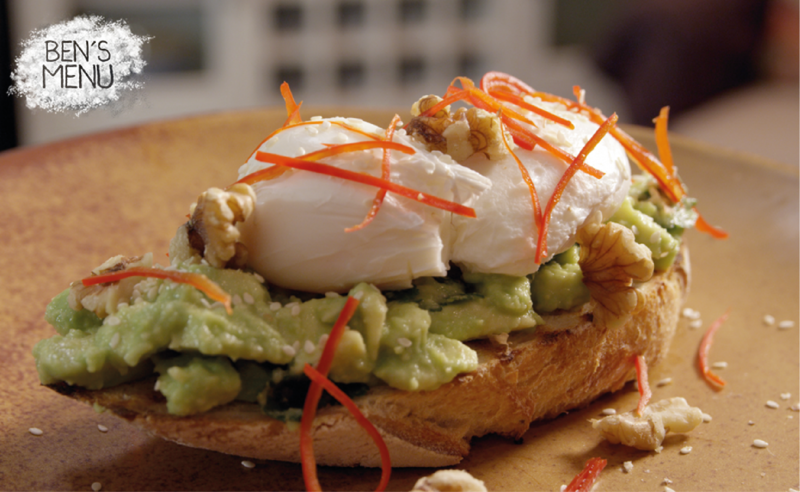 Carefully place eggs on the avocado, garnish with walnuts, sesame seeds and chilli.